Learn how to setup drip campaigns to automatically start based on lead source and if lead origin is a call, email or text. CallAction drip campaign systems is one of the most powerful solutions within our lead engagement automation platform. Automating the tedious task of lead follow-up to calls, text or emails. Once you have created your own custom drip campaigns you'll be able to to have them automatically be assigned to leads responding to your advertising via an inbound phone call or form filled email leads. You can also have them assigned to inbound text messages that are responding to your text for info campaigns. Now, any missed calls will automatically be assigned the selected custom drip campaign. If a person responds by calling back the number, this stops the drip campaign automatically. If you miss the call, CallAction will continue engaging the lead using our missed call text engagement system. 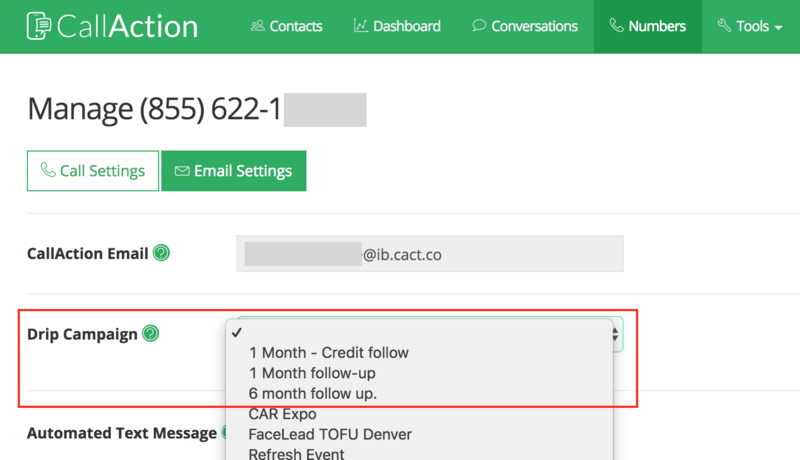 Every inbound email lead forwarded into the CallAction platform will now be automatically assigned your custom drip campaign. If you are not currently a CallAction lead engagement platform user, you may try all of our systems with a risk-free 14 day trial.